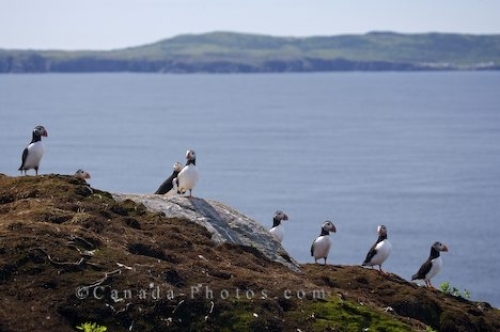 A small group of Atlantic Puffins find life atop the cliff around Bonavista Peninsula in Newfoundland, Canada a very peaceful location for their nesting grounds. The rock cliffs of Bird Island around the Bonavista Peninsula in Newfoundland, Canada is where these cute little Atlantic Puffins find their nesting grounds. A group of Atlantic Puffins leisurely stand atop the rock appearing as if they are having a conversation between themselves about their daily tasks. Picture of a small group of Atlantic Puffins atop the cliff around Bonavista Peninsula in Newfoundland Labrador, Canada.